The Arts Society works to advance decorative and fine arts education and appreciation, alongside promoting the preservation of artistic heritage. We are a UK-based charity with over 91,000 members supporting a network of over 360 local societies in the UK, Europe and Australasia. 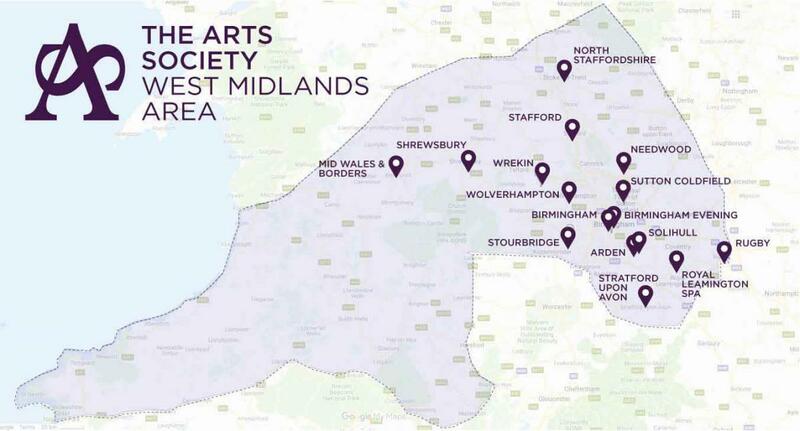 From the Welsh borders to Warwickshire and Staffordshire, there are 16 individual societies in the West Midlands Area, further details of which can be found in the Societies section. Our societies bring together groups of like-minded individuals through regular meetings, lectures by top experts, days of special interest, visits, tours and a number of volunteering activities which include Church Recording, Trails of Discovery, Heritage Volunteering and Young Arts programmes. Become a member and discover a stimulating and enjoyable way to expand your knowledge of the arts and make new friendships! We were delighted to host the national committee and so many members from far and wide at the May 2017 NADFAS annual general meeting in Birmingham, at which we became The Arts Society. Please note that the map display below is no longer dynamic! To find out about any of the sixteen societies in the West Midlands Area just click anywhere on the map and this will bring up the society list - otherwise accessed via the 'SOCIETIES' tab on the above menu. A new society for the West Midlands!